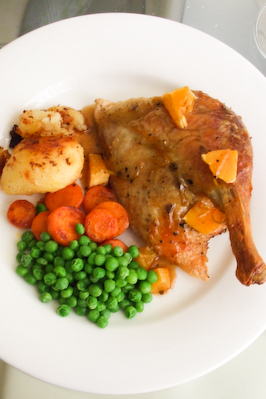 I had to giggle a little bit about the fact that we were eating duck a l'orange for lunch on Australia Day. 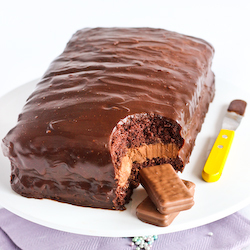 While others were enjoying barbeques and lamingtons around the country, we were preparing this classic French dish. BUT, it did happen to be from my Margaret Fulton Christmas book, which was given to me as a present from the lovely Karen from Citrus and Candy. 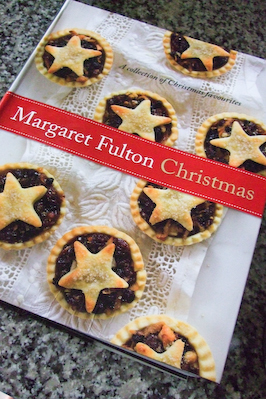 And what could be more Aussie than Margaret Fulton?! We had originally planned to cook this duck for Christmas. We had a bacon wrapped turkey breast, a ham and prawn cocktails on the menu, it was meant to be a daggy, retro Christmas dinner. But our eyes were bigger than our stomach and we barely managed to finish just the turkey and the prawn cocktails. So we finally got a chance to use our duck on Australia Day. It was surprisingly simple to put this dish together. I don't cook often (this is the first savoury recipe on here in how long?? ), so I was happy to help my brother while he did most of it. 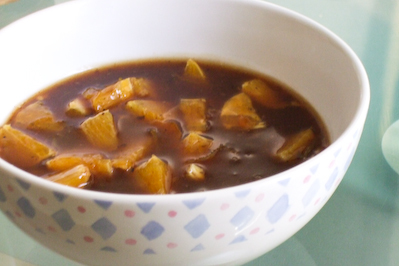 Most of the energy goes into making the rich sauce, strongly flavoured with orange. And the sauce is the key to this recipe, you can't enjoy the duck without it. I found the meat on it's own wasn't orangey enough for me, but with the sauce it packed a nice citrusy punch. And OH MY GOD, how good are potatoes cooked in duck fat?! I hadn't had it in so long, and I had a foodgasm when I tasted them again. If you haven't tried duck fat roasted potatoes yet, you haven't lived. These potatoes were cooked to within an inch of their life, and then fluffed up and tossed into a roasting pan full of the fat that had dripped off our duck. All those little fluffy bits of potato on the outside crisped up into crunchy brown pieces of deliciousness. Preheat oven to 220 degrees C. Remove all the excess fat from the inside of the duck and insert the pared orange rind into the cavity. Season with salt and pepper and truss the ducks. (We didn't have any string so we just skewered everything together...it sorta fell apart but it didn't seem to matter). Pat dry with paper towel and place the ducks, breast side up, in a roasting pan. Bake for 20 mins until the ducks have browned lightly and released some of their fat. Remove the ducks from the roasting pan but keep the excess fat in the roasting pan. 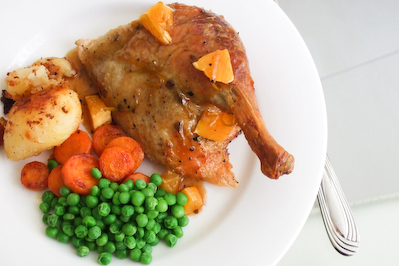 Lower the temperature to 190 degrees C and return the duck to the oven in another roasting pan for an hour. Boil the peeled potatoes in a large pot of water for approximately 20 minutes, until they are cooked through and just about to fall apart. Drain potatoes and very gently toss them around in the colander so that the exterior fluffs up. (If you have time, place the cooked potatoes into the fridge to remove moisture from them, this will make them extra crispy). Return the duck fat to the oven to heat it slightly, then remove from the oven and gently toss the potatoes in the roasting pan of hot duck fat. 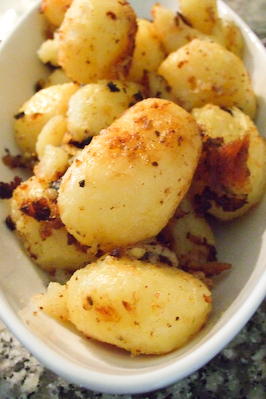 Roast potatoes in oven for around 45 minutes, or until they are crisp on the outside. Ensure they do not burn. Meanwhile, for the sauce, boil the sugar and vinegar over a high heat until it forms a thick syrup. Remove from the heat and gradually stir in the chicken stock. When smooth, put back over the heat and bring to the boil. 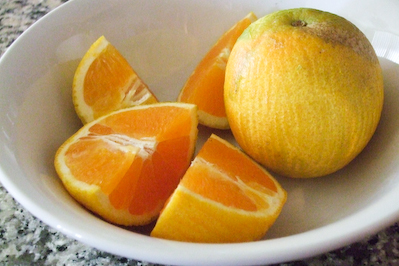 Gradually add the arrowroot mixture and the orange rind. Simmer the sauce for about 4 minutes or until the sauce is clear and thickened. 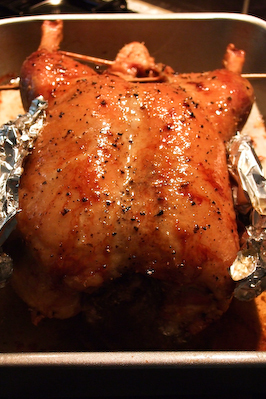 When the duck is cooked, remove the trussing and place them on a serving dish and keep warm. As the duck is awkward to dave, it might be best to carve in the kitchen. Cut straight down through the breastbone and back (use scissors or poultry shears to cut through bone). Lay each half of board and make a slanting cut between ribs to separate the wing and leg, making two good portions of each half. 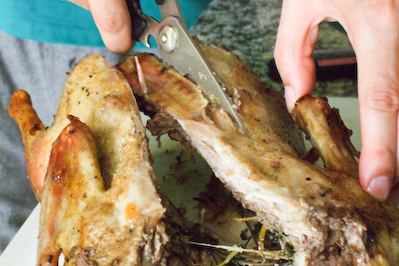 With scissors or shears, trim away any carcass bone. The portion should be two wings and two legs with a good portion of breast attached to each wing portion. 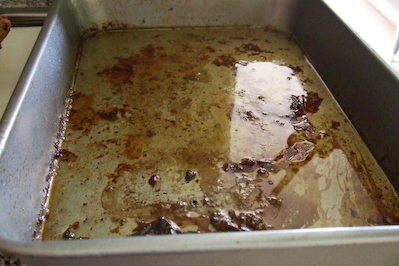 Remove all the fat from the baking dish which held the duck, leaving the juices in the bottom. 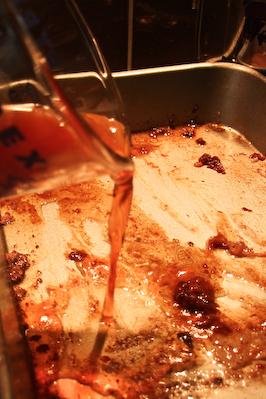 Place over the heat and stir in the port, scraving up the pan juices, allowing it to reduce by half. 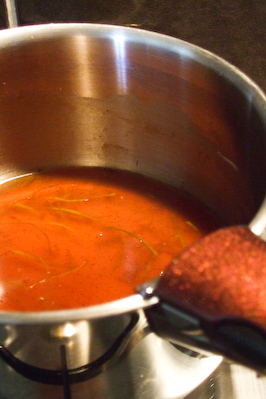 Strain into the prepared sauce base and bring to a gentle simmer, then stir in the orange liqueur. Adjust the seasoning and when ready to serive, remove the sauce from the heat and swirl in the butter. 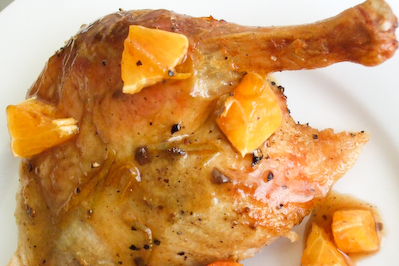 Add the orange flesh to the sauce and spoon a little of the sauce over the ducks to give them an attractive glaze. Serve with the remainder of the sauce and your roasted potatoes. 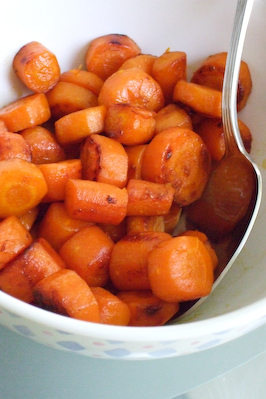 We also served them with peas and buttered carrots. 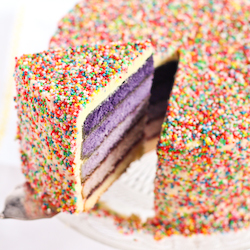 Wow, that looks soooooo good, I can almost taste it! 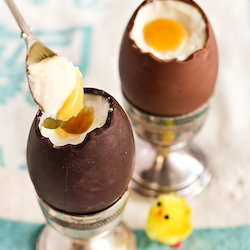 Glad to see a savoury recipe from you! Duck fat roasted potatoes.... you had my attention!! 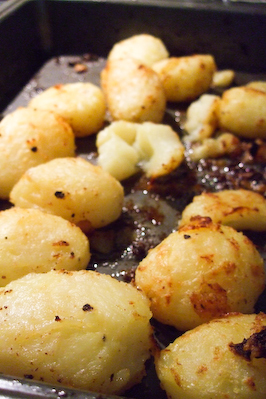 There really is nothing quite as nice as potatoes roasted in duck fat...well, maybe potatoes roasted in goose fat! 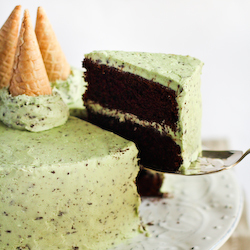 yum this looks so good!! craving some of those duck fat roasted potatoes now! Oh my god! potatoes cooked in duck fat - major major awesomeness Steph!!!! Spuds in duck fat are the BEST! oh baby. that sounds so tasty! and your potatos look so cute! That is one gorgeous duck... lovely recipe! Oh you had me a duck fat! lol. The duck looks fantastic and I think this is a great dish for a multicultural Australia Day. It's all about good food isn't it? The potatoes sound amazing. Oh my, the duck looks so FABULOUS! And the duck fat potatoes? I must have been living under a rock not to know about these babies! Reemski - Heehee :) My brother will be happy to hear that! Simon Food Favourites - Agree. Duck and fruit in general! It was very easy, and very tasty! Ellie - Haha I know, I need to do more! Mmm you should do them, theyre amazing! mademoiselle délicieuse - I agree! I would love to try them with goose fat sometime. Jacq - Oh same...there was definitely not enough of them! Chele - Totally 100% agree! Lorraine - Oh my, don't tempt me! I would cook everything in duck fat if it wouldn't send me to an early grave! Karen - Aww I'm sorry! We only had one duck after all. Next time I promise! where can I buy duck fat? Umm you should be able to find tins of it at gourmet grocers like thomas dux & DJs foodhall, or at good butchers, hope that helps!